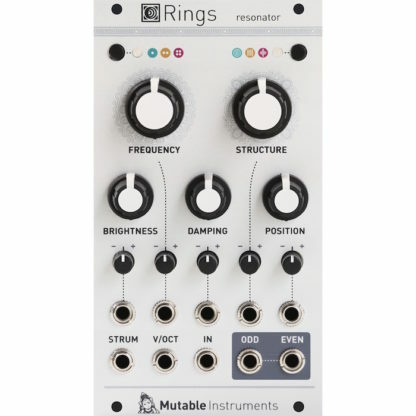 Mutable Instruments RINGS brings physical modelling synthesis to your Eurorack system, from a more modular angle than Braids’ models or Elements. Instead of trying to be a complete instrument, Rings focuses on the key ingredient, the resonator, ready to be excited by envelope clicks, trigger pulses, granular noise or any other audio source produced by the rest of your system. 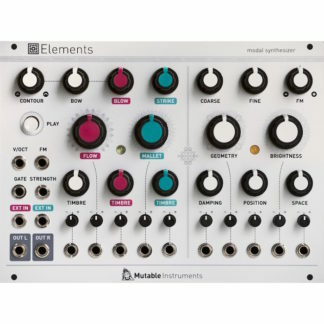 Strings, Membranes and Tubes – as modelled by Elements’ resonator section (modal synthesis). Strings coupled together and vibrating in sympathy, with controllable intervals between them. Strings with a variable amount of inharmonicity. Rings can be configured so that each new note is played on its own virtual string, while the previously played note(s) still decay. 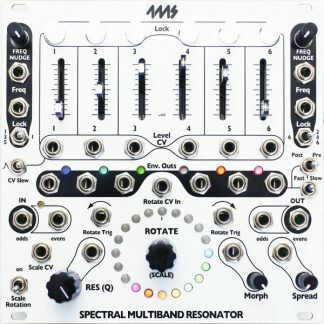 This unique take on polyphony allows the module to play strummed chords. Left Button – Number of strings/structures (1, 2 or 4). Right Button – Synthesis model (modal, sympathetic strings, string). Main frequency (quantized in semitones). Structure – controls the inharmonicity of the spectrum, or intervals between strings (depending on model). Brightness. Specifies the brightness and richness of the spectrum. Damping. 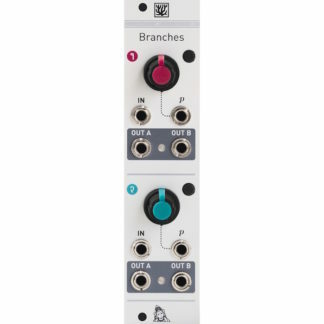 Controls the damping rate of the sound. Position. Specifies at which point the structure is excited. 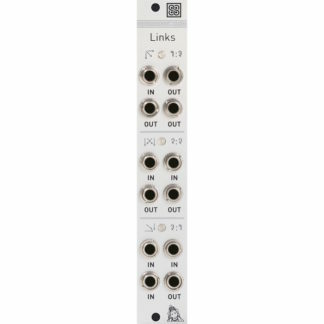 Two audio outputs, splitting the signal into even/odd partials in monophonic operation, or even/odd notes in polyphonic operation.